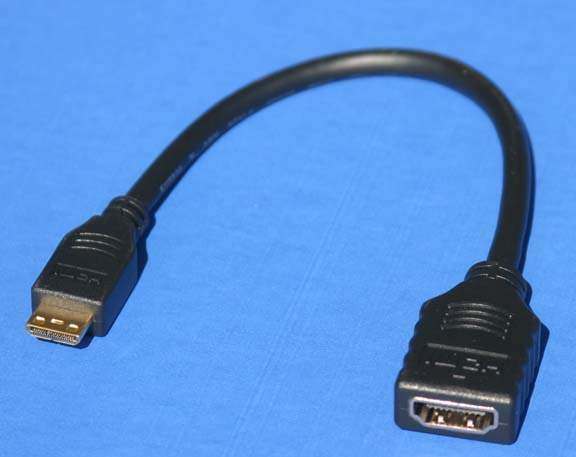 Adapter Cable to Convert a Mini Type-C Connector to Standard Type-A Port. Used to connect Standard HDMI Cables to NEW Mini Connector used on some Camcorders. Premium Quality Item Tested on Canon and Sony Hi-End Digital Camcorders. According to Silicon Image, the HDMI Mini connector is designed so that devices such as handheld video cameras and other playback devices such as portable DVD players -- and soon to be portable Blu-ray and HD-DVD players -- will be able to connect directly to a digital display. High definition content play without having to use separate video and audio cables. Adapter Cable Replacement for Single Cables Listed below. Type-A Connectors is the Standard HDMI Connector. Type-C Connector is what we call a Mini HDMI Connector. Type-D Connector is what we refer to as a Micro HDMI Connector.